Medical assisting in Utah is growing fast, with employment of medical assistants expected to grow by 40 percent between 2012 and 2022. Schools that offer medical assisting programs in the state are already gearing up to meet that demand. According to the Utah Department of Workforce Services, certified medical assistants may have better job prospects than uncertified applicants. This guide focuses on the variety of tasks medical assistants can and cannot perform, what to expect from medical assisting programs, and what might be available in terms of salary across the state of Utah. A medical assisting program is an excellent option for students interested in beginning a career in the medical field. A quality program will teach the area-specific information needed to excel in the field while allowing students to earn valuable credentials. Because finding the right school is a crucial step to starting an education, we’ve found Utah’s best program in terms of graduation rate, cost, and provided student services. 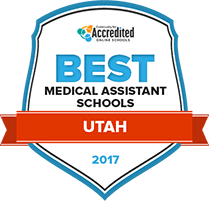 Check out below to find the best medical assisting program in Utah for 2017. Career opportunities for graduates of the Latter-Day Saints Business College medical assistant program include occupations with insurance companies, hospitals, outpatient facilities and HMOs. Coursework is integrated with spiritual growth and Christian principles. LDSBC, which is owned and operated by the Church of Jesus Christ of Latter-Day Saints, maintains an Office of Religion on campus. Students are invited to tour the campus, and if they can not, they're encouraged to take a virtual tour online. The college, which is accredited by the Northwest Commission on Colleges and Universities, offers library services, academic counseling and tutoring services. How are medical assistants described in Utah? In various statutes, Utah defines a medical assistant as "an unlicensed individual working under the direct and immediate supervision of a licensed [or osteopathic] physician and surgeon, and engaged in specific tasks assigned by the licensed [or osteopathic] physician and surgeon in accordance with the standards and ethics of the profession." Utah specifically exempts medical assistants from licensure, but makes no mention of certification. However, those who choose to become certified might find better hiring opportunities in the state, as most employers prefer to hire those who have proven knowledge and skills related to medical assisting. Certification proves that knowledge and skills, and is therefore preferable. Certification for medical assistants in Utah can be earned through any of the following certifying agencies. Remember that these certifications are recognized nationwide, not just in Utah. Is formal medical assisting training required? Complete an approved program. These programs are offered through health care facilities, health care associations and educational institutions. Are there tasks outside the scope of medical assistants in Utah? Understanding what salary to expect can help those in Utah make decisions about a medical assisting career. The following chart compares Utah median wages with those of other medical assistants throughout the nation. The city or metro area in which a medical assistant works can have an influence in their salary. Though those who work in larger metro areas might see higher annual incomes, that isn't always the case. The chart below offers insight into what medical assistants can expect to make in various parts of the state. The growth of employment for medical assistants in Utah is expected to be impressive, hitting almost 40 percent between 2012 and 2022. The chart below breaks that down into hard employment numbers. There are numerous schools in Utah that offer medical assisting programs. The following spotlight school offers a strong example of what students in Utah can expect when they begin to look into these programs. With small class sizes, this community college ensures each student gets all the skills needed to succeed as a medical assistant. Upon program completion, students will not only be ready to take the Certified Medical Assistant exam, but also the Licensed Radiologic Practical Technician exam. The medical assisting certificate program is comprised of 3 semester totaling 42 credits, some of which are offered online. This site has information on the Medical Aide Certified training programs and protocols. The USSMA is an affiliate organization of the AAMA which works to update medical assisting professionals and students about professional advancement opportunities and news relevant to the medical assisting profession. Utah's statute which discusses the practice of doctors in Utah also describes how a doctor may delegate tasks to a medical assistant. Utah's statute which controls the practice of osteopathic doctors in Utah and lists which tasks may or may not be delegated by a licensed osteopathic doctor to a medical assistant. The statute outlining the physician assistant practice in Utah provides for certain exemptions from licensure for medical assistants who are working under the supervision of a doctor and do not engage in certain medical acts.